Chickpea (Cicer arietinum L.) is a cool season food legume crop grown on >10 million ha in 45 countries of the world. Chickpea is either the first or the second most important, rain fed, cool season food legume, grown mainly by small farmers in the semi-arid tropics (SAT) and West Asia and North Africa (WANA) regions. The crop is also grown in southern and eastern Africa (particularly important in Ethiopia), Europe, the Americas and, more recently, Australia. Chickpea a temperate crop, probably originated in south-eastern Turkey and spread to other parts of the world. Crop improvement efforts have improved adaptation of chickpea to warmer conditions in the subtropics. The two most common types of chickpea, are the white-seeded "Kabuli" and the "Desi". Kabuli types are mostly grown in WANA, the Americas, and Europe, while the desi types predominate in Asia, parts of Africa, and Australia. 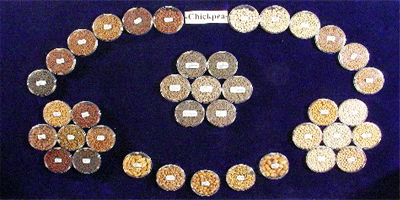 Chickpea is an important source of protein in the diets of the poor in the SAT and WANA regions, and is particularly important in vegetarian diets. Also, it is being used increasingly as a substitute for animal protein. Chickpea is an annual plant with plant height ranging between 30-70 cm, but tall types with >1.0 m in height are cultivated in the erstwhile USSR. The foliage is covered with glandular hairs which secrete highly acidic exudates, and is considered important in conferring tolerance to insect pests, such as the pod borer. Leaves are compound, arranged in an alternate phyllotary, and generally imparipinnate with 11 to 13 leaflets. Flowers are axillary, solitary, or in inflorescence of two or three. They are white, pink, purplish, or blue in color. The plant has a deep root system and is considered a hardy crop. It produces nodules in common with other legumes, and is efficient in fixing atmospheric nitrogen (N) in a plant-usable form through biological nitrogen fixation (BNF). The crop is highly efficient in uptake of phosphorus (P) from soils containing low amounts of available P.
Chickpea is grown mostly as a rain fed, post rainy season, winter crop in subtropical south Asia, parts of Africa, and Australia. It is a spring season crop in the temperate and Mediterranean types of climates. In traditional production systems of Asia and Africa it was grown as an intercrop, but in recent years it is mostly cultivated as a sole crop. In low input traditional production systems chickpea has been a preferred crop because of its minimal dependence on monetary inputs of N and P-containing fertilizers, irrigation, and agrochemicals in general. Chickpea is known to confer contribute to sustainability to cropping systems. Click here for Taxonomic classification of Cicer sps.